Power Engineers Company is Manufacturer, Exporter & Supplier of servo controlled voltage stabilizer (U.K. based Brentford type) from 100 to 7000 kva capacity in Vadodara Gujarat. We are using LINER TYPE REGULATOR WITH ROLLING CONTACT CARBON ROLLERS. Provide an UNCONDITIONAL FIVE YEAR GUARANTEE for all the equipment. After sales service is the backbone of our organisation. LINEAR, PLUS / MINUS TYPE VERTICAL ROLLING CONTACT VOLTAGE REGULATOR » Automatic Voltage Controller primarily consists of the following 1. LINEAR, PLUS / MINUS TYPE VERTICAL ROLLING CONTACT VOLTAGE REGULATOR In our voltage regulator we are using heavy section of electrolytic grade rectangular copper strip instead of copper wire to minimize the losses & increase the efficiency of equipment. We are also using self lubricating carbon roller assemblies instead of ordinary carbon brushes which offer more reliability and trouble free performance of the equipment. 2. DOUBLE WOUND BUCK / BOOST TYPE SERIES TRANSFORMER In our Buck / Boost transformer we are using CRGO lamination to minimize iron losses. Coils of Buck / Boost transformer are wound with heavy section of multi strips electrolytic copper to minimize copper losses for getting better efficiency of the equipment. 3. ELECTRONIC CONTROL CIRCUIT AND METER PANEL Automatic Voltage Controller consists of very simple electronic control voltage circuit for monitoring and controlling voltage, repair & maintenance of which is very easy. The regulator and Buck / Boost transformer are oil cooled, housed in same or separate sheet steel tanks. Radiators are provided for effective cooling. The coils of voltage regulator & Buck / Boost Transformers are vacuum impregnated and oven dried as per IS. 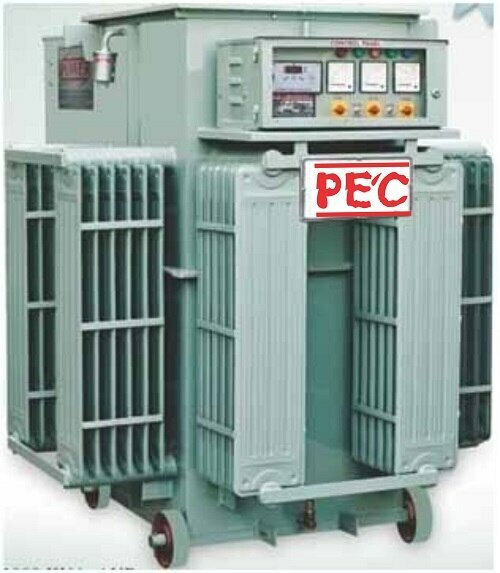 Special Features Special Features Of PEC Make Automatic Voltage Controller: EFFICIENCY The efficiency of PEC make Automatic Voltage Controller is more than 98-99% in comparison to 93-97% of conventional make available in the market depending upon the input voltage range. Thus, a 500 KVA conventional type stabilizer or conventional servo voltage stabilizers will consume additional power itself minimum Rs. 80,000 p.a. (even when running at 60% load and 20 hours a day) on account of its lower efficiency by 2%. BETTER LIFE The life of make servo voltage stabilizers is more than 10/15 years at full load in comparison to 2/3 years of conventional make. DUTY CYCLE Conventional type stabilizers are suitable for 30-40% load on continuous duty cycle. Our automatic voltage stabilizers are Heavy Duty & Industrial type and are suitable for 100% load continuous duty cycle. For running load of 200 KVA, generally 400 KVA / 500 KVA conventional type stabilizer is installed while make 200 / 250 KVA is suitable. GUARANTEE Our automatic voltage stabilizers are guaranteed unconditionally for 5 years as compared to 1 year of conventional make. PAYBACK PERIOD Owing to its high efficiency and associated benefits, the payback period for the cost of POWER’S Servo Voltage Stabilizers is from 6-12 months depending upon the input voltage variation and number of working hours of the plant. The HIGHER the input voltage the SHORTER will be the payback Period.